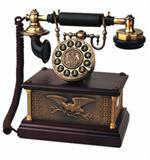 World To Home is the source for antique reproduction telephones & old phones for sale, specifically engineered to be just like the originals from the early 1900's. We have a wide selection including antique wooden telephones, brass phones, antique candlestick phones, princess phones, Crosley phones, classic american old phones for sale and more. 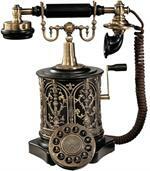 See below for our antique reproduction telephones from America, Europe, or France. These replica antique telephones are fully operational and hand-assembled using the highest quality materials and metals. 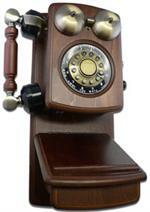 Replica reproduction phones are rotary crank and French style antique phones for sale. 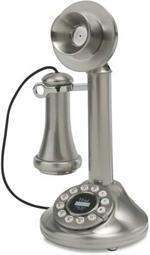 True authentic looking reproduction phones from 1890-1940's. Each is crafted after an actual phone when it was originally introduced. These antique telephones have push button tone dialing, a center medallion button for redial and a 6 foot cord that is felted for the brass and wooden models. 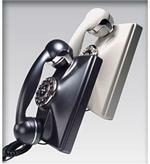 The ringer and receiver volume is adjustable on the vintage retro antique reproduction phones for sale as well. Will make a great addition to any room, adding a touch of antiquity and elegance. Also makes a great gift! Looking for more antique retro products? 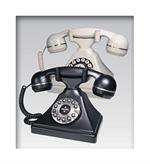 Check out our antique record players, reproduction MP3 telephones, collectible telephones, and Motorola phones. Inside you'll find more of your favorite antique and modern reproduction products in a variety of styles. 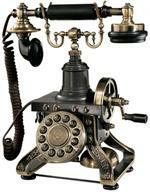 Also, be sure to take a look at our brief history of antique telephones resource pages for info on collecting and displaying your vintage telephone.